/ The Domopalooza survival guide. The countdown is on to Domopalooza. Domo’s annual user conference is happening this month — March 21-25th, to be exact — and it’s time to start prepping to make sure you take full advantage of everything Domopalooza has to offer. 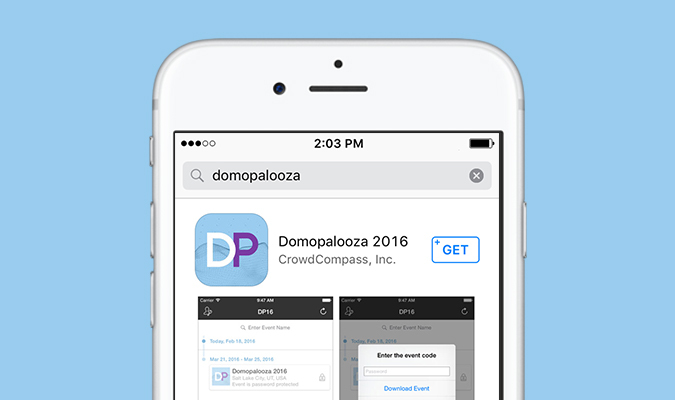 First things first, if you haven’t registered for Domopalooza yet, do it now. And if you still need a little convincing (or maybe your boss does), check out 18 reasons to register immediately for Domopalooza. Agenda builder is included in your registration and will get you connected to all the sessions going on at Domopalooza and help you fill up your schedule with those you want to attend the most. There’s a lot going on, so make sure you check out all the options. It’s worth saying again: there’s going to be a lot going on at Domopalooza. From sessions, to speakers, to entertainment, stay up to date with all the Domopalooza goings on through social. Follow us on Twitter, Facebook, Instagram, LinkedIn, and Snapchat [username: Domotalk], and don’t forget to post a about your experience with #DP16 to join the conversation. You really don’t want to miss them. Earvin “Magic” Johnson, Domo’s founder and CEO, Josh James, and General Stanley McChrystal are headlining this year’s speakers. You’ll also want to be there to hear from some of our customer speakers and how they’re answering business questions with Domo. Check out who else will be hitting the Domopalooza 2016 stage here. This is a business conference, after all. Domopalooza is designed to help you have the kind of conversations you want to with other big players in the business world. Don’t forego the Hub Crawl. It is the place to meet people and happens every night from 6:00-7:30 in the Expo Hall. Drop by the Brilliance Bar. Got questions about using Domo? The Brilliance Bar is your chance to get immediate, hands-on help with everything from building cards to importing data. Our Brilliance Bar staff really knows their stuff. Domopalooza 2016 has its very own app, packed with info about sessions and exhibitors, as well as a super helpful map of the venue to help you get around. The app also gives you access to live polling, social interactions, and publishing. You can find it in the Apple App Store and Google Play, or visit us @domotalk to download it. This isn’t Domopalooza’s first rodeo. Take a bit of advice from the pros who learned how to run the show last year. There’ll be plenty of coffee and Redbull to combat the late nights. There’s also going to be a lot of really good food. No need to pack your own snacks. Bring a few power packs for your devices. But if you forget, don’t worry: there will also be charging stations set up around the venue so you don’t have to run back to your room in the middle of a session. Pace yourself. There’s a lot to take in, and it’s easy to get burned out on day 1, only to sleep through the free breakfast and early sessions the next morning. Take a break and stroll around the Grand America. The 5-star hotel features several hand-blown glass chandeliers from Murano, Italy, and an array of boutique shops. Explore the city. Salt Lake’s Trax system is free within the downtown area, and a small fare takes you to Rice Eccles stadium where you can see the torch and other memorabilia from the 2002 Olympic Games.